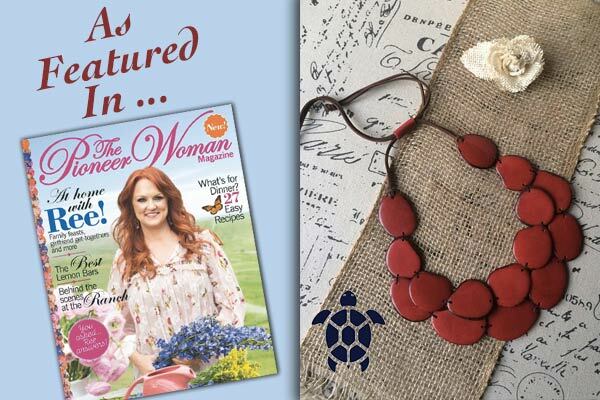 Today we are happy to announce that our Galapagos Tagua Brand jewelry had the honor of being featured in “The Pioneer Woman Magazine” by Ree Drummond. They chose our beautiful Red Statement Tagua Nut Necklace as part of their piece on chunky necklaces and we couldn’t be happier. It all started in December, when I was contacted by the staff of the magazine, because they had fallen in love with our necklace. Once they received our samples, they told me, it was exactly what they were looking for and gave me the amazing news that my necklace would be highlighted in The Pioneer Woman Spring issue. I can’t help but feel humbled and honored by this amazing opportunity my online store has been given. I am so happy to share with the world these beautiful, fair trade, eco-friendly and handmade Tagua jewelry that comes from my beloved home country of Ecuador! Handmade with love by women for women! 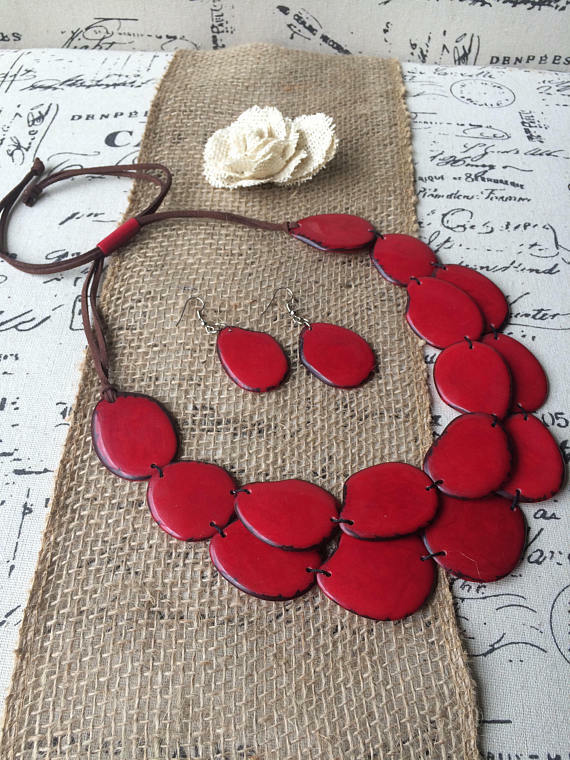 Click here to get your Red Tagua Necklace today. Valentine’s Day is behind us and now is the perfect time to start exploring the Spring and Summer trends for 2018! All in all, the accessories that we are seeing in the main fashion capitals are all bold, big and outrageous, far cry from minimalist vibes and just in time to make headlines. This year, let your accessories do the talking. Here at Galapagos Tagua we offer you the highest quality jewelry, made of “vegetable ivory” as Tagua is also known. All of our products are Eco friendly and Fair trade. By shopping with us you are supporting a tradition decades old, we work hand in hand with our team of artisans in Ecuador to provide to you the highest handmade jewelry in the market. Thank you for choosing us! It’s our pleasure to serve you, do not hesitate to contact us. And don’t forget, now we have a live chat on our website, where you can reach us instantly! Looking for the perfect gift for this upcoming Holiday season? Our Eco friendly jewelry makes the perfect present for any jewelry lover! Check out this Beautiful red beaded bracelet! 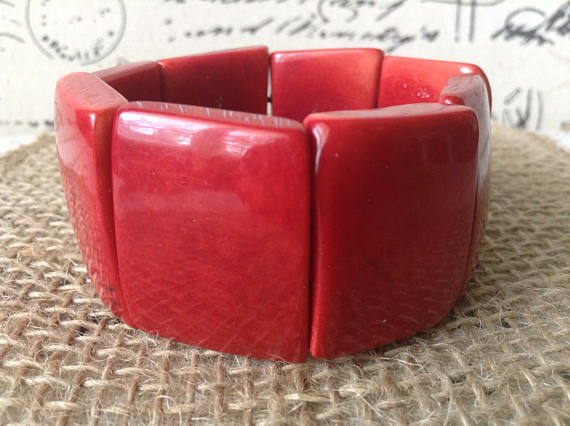 This beautiful statement bracelet is made of Tagua nut, found on the Rainforest in Ecuador. 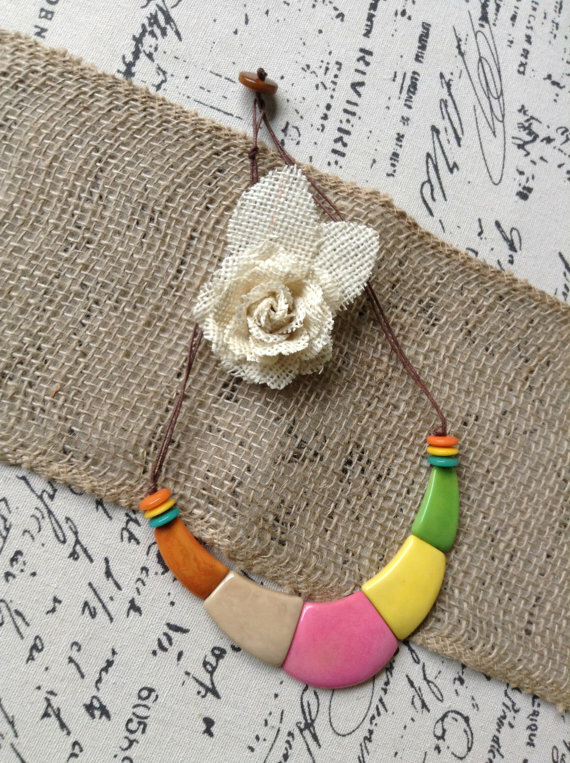 Tagua is manually harvested, carved, and dyed to bring to you this beautiful jewelry pieces! Dress it up or down, it will look stunning either way!, it’s lightweight, yet very resistant and comfortable to wear. You definitely want to add this one to your Christmas Gift list this year! This bracelet is made of 8 Tagua beads, each measuring approximately 1 3/4 inch wide (2 cm) by 1 1/4 inches long ( 3 cm). It’s strung by 2 rows of strong elastic. All of our jewelry comes directly from Ecuador, where it has been made by local artisans. Start your Holiday Shopping today! Check out the beautiful, rich colors of our jewelry, perfect for this upcoming Christmas. This Red Statement Necklace Set is the perfect gift for any jewelry lover! This set has a bib adjustable necklace, with leather straps, that go up to 20 inches long. The dangle earrings are about 2 inches long (4 cm). The beads have been sewn together with waxed cotton cord.